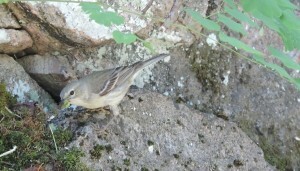 4 June 2015 – Today, along the N shore of Crow Lake in Central Frontenac, I observed a female Pine Warbler foraging along a rocky slope, collecting caterpillars to feed to its young. Photo: Pine Warbler (f). Note: large bill; faint, thin, dark eye line ‘cutting’ through two thin white eye arcs; pale supraloral (area just above the area between base of bill and the eye); pale neck contrasting w/ slightly darker cheeks; pale yellowish below (varying intensity), light olive-gray and generally unstreaked above; two whitish wing bars; short primary projection; long tail. Overall GISS: Husky, large-billed, long-tailed warbler.